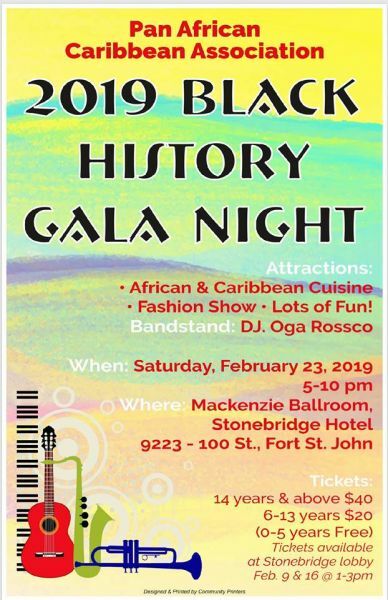 The Pan African Caribbean Association of Fort St John would like to invite you to a Gala to celebrate Black History Month on February 23rd, 2019 at the Mackenzie Ballroom, Stonebridge hotel, 9223-100 Street in Fort St John. Come experience a wide range of African and Caribbean cuisine, African beats by DJ Oga Rossco, a Fashion show with the latest African trends and other live entertainment. Tickets are $40 for 14 years and above and $20 for children 6-13 years. Children under 5 are free. Tickets can be purchased by calling 250-793-5585. There will also be tickets available for sale at Mackenzie Ballroom - Stonebridge hotel on Feb 9th and 16th from 1-3pm.